What Exactly Are Packing Spaces Good For? Let’s start with the exterior pockets. 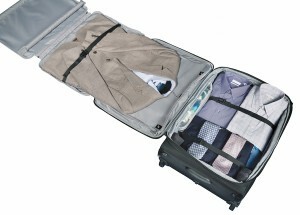 Travelpro Rollaboards typically have two exterior pockets on the lid of the suitcase. The large one allows the traveler to store a light jacket if you’re traveling to or from the cold, and you’ll only need your jacket for one leg of the trip. It also provides handy access to a sweater, a book, a newspaper or magazine, or a tablet. Storing electronics in this pocket is not recommended for checked baggage, as it affords the least amount of protection from possible damage. The smaller exterior pocket is designed to provide storage for handheld electronics, power cords, and a boarding pass. This is especially helpful if you are traveling light and don’t have a separate purse or bag for such items. There are several interior packing spaces which help segment clothing and other accessories while en route. The interior lid pocket is full-sized and is usually either mesh or lined. In some Travelpro models, our suiter system functions like a small garment bag, creating a tri-fold of a suit jacket and pants that then zips into the lid. Putting dress shirts or other items in here you don’t want to wrinkle keeps the weight of the other items off those that are delicate. This pocket is also helpful for separating accessories such as ties and undergarments if two people are sharing one suitcase. The large accessory pockets in the main cavity can be used for shoes or anything bulky that needs to be contained. Smaller accessory pockets are designed to help store items that could get lost in the “sea” of the main compartment, such as jewelry, power cords, belts, or toiletries. Some cases come with wet pockets, which have been lined with plastic so damp items or toiletries that could leak won’t damage your other items, should they leak or explode. This area can also be used to separate dirty clothes from your remaining clean clothes or to store a damp swimsuit. Many bags come with expansion zippers that increase the capacity of the main compartment. This option is helpful, but should be used to accommodate clothing purchased during a vacation or gifts received during a trip. If you make a habit of using this feature, you run the risk of exceeding the weight limit for your bag or drawing the attention of the attendants during boarding as being too thick for the overhead bins. How do you use your suitcase’s packing spaces? Do you just put everything into the main compartment, or do you use them for different functions and features? We’d love to hear your creative solutions in the comments, on our Facebook page, or in our Twitter stream.